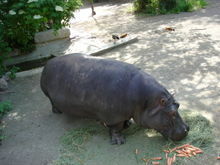 The common hippopotamus (Hippopotamus amphibius), or hippo, is a large, mostly herbivorous mammal in sub-Saharan Africa, and one of only two extant species in the family Hippopotamidae, the other being the pygmy hippopotamus (Choeropsis liberiensis or Hexaprotodon liberiensis). The name comes from the ancient Greek for "river horse". After the elephant and rhinoceros, the common hippopotamus is the third-largest type of land mammal and the heaviest extant artiodactyl. Despite their physical resemblance to pigs and other terrestrial even-toed ungulates, the closest living relatives of the Hippopotamidae are cetaceans (whales, porpoises, etc.) from which they diverged about 55 million years ago. Hilaire Belloc, "The Hippopotamus", The Bad Child's Book of Beasts (1896). Parody: American women shoot the hippopotamus with eyebrows made of platinum. E. M. Forster, Abinger Harvest (1936), 'Mickey and Minnie'. T. S. Eliot, "The Hippopotamus". Lewis Carroll, A Selection from the Letters of Lewis Carroll to his Child-Friends (1933) edited by Evelyn M. Hatch, Letter to Gaynor Simpson (27 December 1873), p. 91. G. K. Chesterton, Charles Dickens ch. 10. Michael Flanders, The Hippopotamus Song. There is something about a blurb-writer paying his respects to a funny book which puts one in mind of a short-sighted lord mayor raising his hat to a hippopotamus. Michael Frayn, Introduction, The Best of Beachcomber. Alasdair Gray 'The Scottish Hippo', a parody of T. S. Eliot (he jokingly claimed this was a lost work by R. Crombie Saunders, but in fact it was his own). This page was last edited on 3 October 2018, at 12:05.